Dechen Namrol (Tib. བདེ་ཆེན་རྣམ་གྲོལ་, Wyl. bde chen rnam grol), ‘The Display of Great Exaltation’, aka Rigdzin Düpa Dechen Namrol, is a Guru Rinpoche practice of the Dudjom Tersar lineage, and a combined revelation of Dudjom Lingpa and Dudjom Rinpoche. The Dechen Namrol is similar to the Rigdzin Düpa of the Longchen Nyingtik but distinct from it as it is a more extensive lama practice sadhana which includes Tsok, Dharma Protectors, Tormas, and other practices. 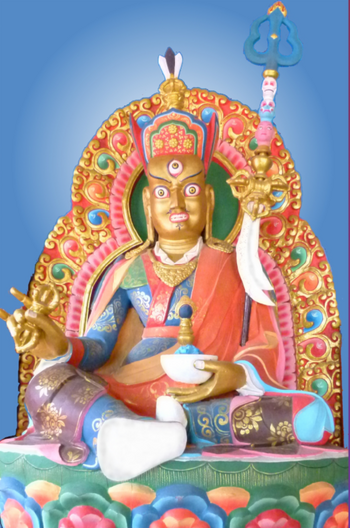 In the Dechen Namrol, the central figure is Guru Rinpoche in the Nangsi Zilnön form, so not shown in union with a consort but single, with one foot and a vajra in his right hand. He has a more wrathful expression than other forms, and has a third eye blazing in his forehead. As in the Tukdrup Yang Nying Kundü, Guru Rinpoche is surrounded by the Eight Manifestations of Guru Rinpoche, which is quite rare among the many lama sadhana termas of the nyingma tradition. During the 19th century, the Dechen Namrol sadhana was first originally revealed by Dudjom Lingpa as a lama practice of his terma cycle the Zabsang Khandro Nyingtik ‘The Profound Doctrine of the Heart Essence of the Dakinis’. In 1925, the practice was later rediscovered by Dudjom Rinpoche as a gongter at the age of nineteen, while he was in Kongpo Drasum in southern Tibet. Dudjom Rinpoche revealed this terma of his predecessor with modifications, adding many aspects to the sadhana, such as the visualization of mandala of the eight manifestations of Guru Rinpoche. Dudjom Rinpoche combined the two termas into a comprehensive ‘Lama sadhana Rigdzin Düpa’, and at that time renamed it Dechen Namrol, ‘The Display of Great Exaltation’. Tulku Orgyen Phuntsok said that “As this sadhana combines both termas, the blessings of both are ensured through practicing it”. During the time of Dudjom Lingpa, in Golok, the Dechen Namrol was the main lama practice of the Dudjom Tersar, and the inner-most secret form lama sadhana. The practice was then called ‘The Excellent Treasure Vase of Siddhis’. When Dudjom Rinpoche established his ngakpa community in Khorlo Dratsang, Upper Pemakö, in Tibet, he specifically established the Dechen Namrol as the central practice of his students there. Dudjom Rinpoche asked his students to practice the Rigdzin Düpa Dechen Namrol on each Guru Rinpoche Day, and to use this sadhana for their Vajra Guru mantra recitation as part of their Three Roots practice. Later, when the community moved to Lower Pemakö (the India side) and founded Deden Tashi Chöling, Dudjom Rinpoche appointed one of his heart disciples, Togden Kunzang Longrol as the head of the nagkpa sangha. And since then, the Rigdzin Düpa Dechen Namrol sadhana has remained a constant practice at this place both as a monthly tsok practice, but also as part of the Three Roots accumulations. In 2014, Tulku Orgyen P'huntsok completed for the first time a translation of the Dechen Namrol in a language other than Tibetan — in English — and has introduced and lead the actual practice for the first time in the West, in Santa Barbara, USA, and possibly for the first time anywhere outside of Pemakö. ↑ Presentation of the Rigdzin Düpa Dechen Namrol by Tulku Orgyen P'huntsok, on http://pemakoddharmawheel.org/whats-new/.